A clean distinct folk sound not straying too far from the roots. Houdini’s Blues is an album that searches for truth, where sometimes the vocals scarily resemble that of the late Skip James. From songs like Dream Song #1 with it’s slow but very effective searching rhythm makes way to a slapping harmonic piece like “Hail To The Theif”. This is no Radiohead cover, it’s better, it’s the real thing. Add to the combination, classic folk singer songwriter songs like “Strong Storm Rising” and “All Come To Reap The Goldrush” with honest lyrics accompanied by graceful guitar playing and you have one mighty fine album. Folk, the people’s music, means many things to many people. Folk music often seems squeezed from above and below. Pop music, and the folk-fusions that follow in its wake, are seen by some purists as diluting the folk tradition. At the same time it seems that this ‘people’s culture’ is scorned by the cultural establishment. In the last few years, however, a revival of English folk music has seen a plethora of new folk styles sprout up, from nu-folk to twisted folk, from Bat for Lashes to Tunng and even twindie, a new generation seems to be giving folk new meaning and an unexpected lease of life. Has folk finally left behind its parochial, twee image? Politics seems to be an essential part of the revival. From the Levellers’ Battle of the Beanfield to Clan Dyken’s ‘eco-folk’, have ‘new age’ subcultures and green politics helped to recover folk’s radical roots? Some hope a revived folk tradition might help create a more ‘radical’ English identity and heritage, an alternative to the flag-waving jingoism of Rule Britannia. Liberal peer Lord Redesdale wants to have 14,000 morris dancers at the 2012 Olympics. But is folk in danger of being co-opted and sanitised just as it seems to be reinvigorated? At the start of the 20th century progressive enthusiasts propagated the idea that folk music could reconnect ‘the people’ with their past, and with each other, and inspire a collective outlook. In the very different political context of the 21st century, is folk music fulfilling its potential, or is it just another brand? Join the legendary singer Barb Jungr, the Daily Telegraph music critic Ivan Hewett, Time Out music editor Eddy Lawrence, together with the music journalist Neil Davenport, music scholar Cara Bleiman and folk enthusiasts Don Eales and Abdul Rehman-Malik in discussion with the Institute of Ideas and Guardian arts blog’s Shirley Dent to find out who really does give a folk. Hang on to your harmonica and prepare to fight your corner in the first Time Out Battle Satellites 2008 in association with Vibe Live. Dope - a film by Sheldon Rochlin and Diane Rochlin. Shot in the lilting, evocative style of filmmakers Sheldon and Diane Rochlin, the film-celebrated for its subversive content-was shown at the Whitney Museum of American Art in 1975. 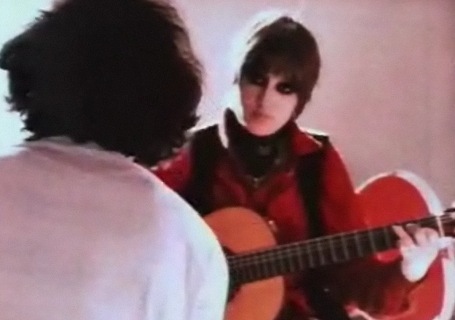 Praised as a film "ahead of its time” by Ricky Leacock, the Rochlins signed a distribution contract with Leacock-Pennebaker. But just as the final editing was completed, the distribution arm of Leacock-Pennebaker went bankrupt. The film has remained an underground indie classic ever since. This is a feature documentary about a young girl’s descent into drugs. Shot in late-sixties London, we see ravishing Caroline--black makeup around her eyes and tattooed head to toe--become a junkie. We come to understand not only the drug lure of the era, but also the soul of a free spirit who is caught in the grip of forces she cannot penetrate or comprehend. Like a butterfly caught in a web, Caroline struggles against her fate, but its seductive attractions threaten to vanquish her. 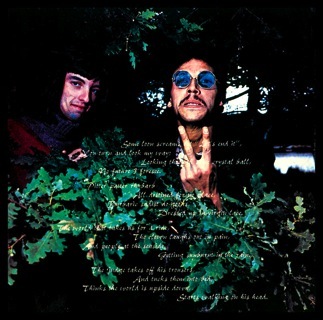 London 67-68, features music by GENO FOREMAN (Cocaine, When You Hear Those Cuckoos Calling, Some Call Me a Junkie..) and a voice also tells the "story" of Geno's death in London. A gem from the past rediscovered. A mega rare album rediscovered in the autumn of 2007 by Acrobat Music after acquiring the catalogue of recorded works owned by The Kruger Organisation. Previously available only on vinyl and very hard to find this album consists of 18 tracks including bonus material not on the original release. Its unsure how many copies of the original album were sold due to "an offensive hand signal" inside the cover many shops refused to stock it. As a result it was completely withdrawn from sale almost immediately after release, with only a tiny handful of First pressings ever sold. 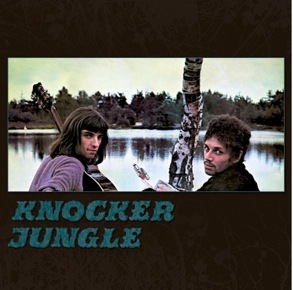 To quote Acrobat Music "The music of Knocker Jungle is a fascinating snapshot of a strand of the pop and rock scene that was at the core of what was called “progressive” or “underground” music at the back end of the 60s and early 70s. " Acrobat Music have done a great job re-releasing this classic album. "...Wow, we have here 16 great songs with diverse styles like country, Chicago blues, gospel, jazz, Dixieland honky-tonk and swing. On Heaven you can listen to very catchy numbers with quick changing music styles in which the witty worked out texts are sung through considerable vocal chords of this talented singer. I believe that Zach Lupetin knows the blues deep down in his soul and that is why he is able to incorporate it in his songs in many diverse ways. When he still studied at the University of Michigan he played with the band “the Midnight Special” a school blues band from which he recruited some musicians from for his CD. 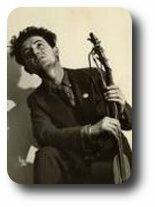 His musical examples (idols) are clearly John Prine, Wayne Hancock, Ramblin’ Jack Elliot, Django Reinhardt, Muddy Waters, Leadbelly, Jimmie Rodgers and the Carter Family among others. The first song on this CD is called “Maybe Baby” and is a blues number tinted with guitar, upright bass, and soft drum accompaniment as well as lively gospel singing and clapping. Some songs are reminiscent of the pre war 20’s to 40’s, which may seem funny for young twenty something guy. Songs like “Mama Said”, “End of the Road” and “”Get Out” illustrates what we mean by this. Textually there is also a portion (big portion) of humor in the songs, showing that they must have a had a great time recording the album, especially in songs like “I Wish That I never Had Met You” and in the seven minute long “Get Out”. “Say You Will” on the other hand is a more traditional ballad and the basic of blues words are held up in “Boo Hoo Blues”. 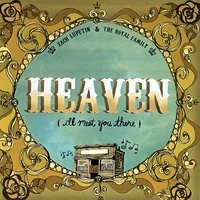 The title track “Heaven (I’ll Meet you There)” appeals on the beginnings of storytelling blues. Livelier (or happier) is “Another I Don’t Love You Song” and “Superkiller # 405””. If I can chose my favorite song I would go for “La Sangre Lake” that really is completely different from the other songs on this CD. This is a real different record that I would strongly recommend it to lovers of nostalgic blues and country who dig that timeless, happy sound. Zach Lupetin is currently touring throughout California with his new group “The Dustbowl Revival”, a "good old-time string group" as he calls them. Check them out here: www.myspace.com/znlupetin. Fantastic CD! Keep on doing what you do, Zach! 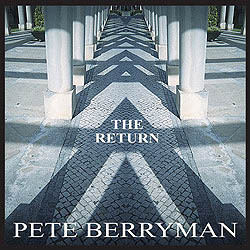 Peter Berryman arrived on the acoustic music scene in the 60's with the Famous Jug Band which also featured Clive Palmer of the Incredible String Band. At this time he also recorded with Ralph McTell, Wizz Jones and Al Stewart and in 1971 his influential LP with John James , Sky In My Pie,was released. Since then he has collaborated with many notable musicians, worked in theatre and film, and played as far afield as Hokitika and Abidjan. "Pete is one of the unsung heroes of the British acoustic guitar movement." " A brilliant Band...I think this [EP] is absolutely amazing "
Celtic, Balkan, Gypsy, Latino, Cornish. All these influences and more are in evidence within 3 Daft Monkeys’ music. Far too diverse to be pigeonholed into 1 genre, and possessing a sound completely impossible to typecast into being a particular “style”, 3DM traverse Dance, Dub, Punk, Reggae and Traditional Folk with ease, creating a stunning blend of upbeat, danceable music which despite all its world influences remains undeniably British. Go Tell The Bees EP showcases 3 tracks from band’s forthcoming album “Social Vertigo”, scheduled for released in early 2008. Also included is a remastered version of Astral Eyes from their previous album “Hubbadillia”. To date Hubbadillia has sold over 5,000 copies purely through word of mouth, and without any distribution or label deal. 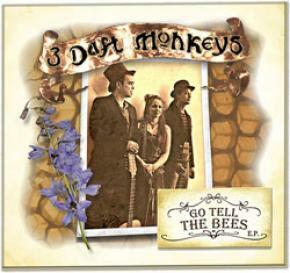 3 Daft Monkeys have already played to tens of thousands of people across numerous venues and festivals around the world, both as headliners and support for a variety of major acts. Recent festival highlights include Folkwoods, Holland; Glastonbury Festival 2007 (3 sets); Folk Segovia, Spain; Lorient Interceltic Festival, France; Kevelaer World Music Festival, Germany and Labadoux Festival, Belgium. Over 5000 people watched their main stage performance at Beautiful Days 2007 and the band will end their summer festival season with a performance at Bestival. Whatever your taste in music, 3 Daft Monkeys offer something special and their unique blend of high octane, funked-up folk is guaranteed to even the greatest cynics dancing!